Leonardo is attending Eurosatory 2018 (Paris, June, 11-15), the biggest international exhibition dedicated to the land and air land Defense and Security domain, showcasing its latest land technologies. In the current worldwide theatre, where conventional threats combine with new asymmetric ones, Leonardo is an even more reliable partner of choice for the Armed Forces. Leonardo is able to offer all the enabling expertise and technologies to assure an unmatched information superiority, situational awareness, command and control capability, weapon system management, interoperability and network communications. To address the security requirements of deployed Armed Forces, Leonardo is presenting its FOB (Forward Operating Base) protection system architecture, a solution that, thanks to its high flexibility and modularity, is able to provide superior surveillance and threat detection capabilities for military bases, airports, peacekeeping camps and other critical infrastructure. Furthermore, on display are some of the members of the SWave SDR product family which include handheld, man pack and vehicular tactical radio systems. 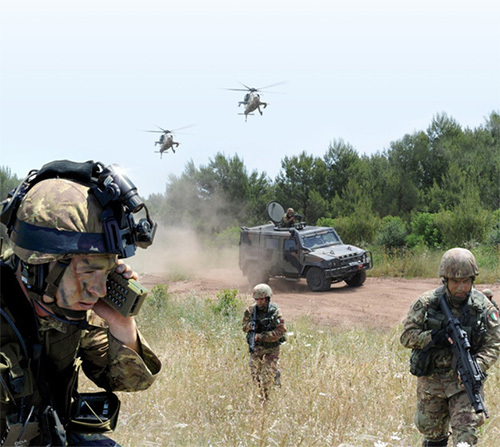 As an expert in the latest SDR (Software Defined Radio) technology, Leonardo has taken an important role in support of the interoperability of European Land Forces in joint mission within the ESSOR consortium in developing a shared EU radio architecture and a common European waveform, the ESSOR HDR WF (High Data Rate Waveform). The company is also involved in the Generic Open Soldier System Reference Architecture (namely “GOSSRA”), a project aimed at producing an open architecture to be standardized among European nations, defining a future modernized soldier system that achieves effectiveness and cost-efficiency. At Leonardo’s stand virtual immersive simulation technology enables visitors to experience a “highly realistic” operational battlefield environment at dismounted soldier level, fully integrated with the Command and Control chain. As a further demonstration of Leonardo’s integration and interoperability capabilities for the digital battlefield, a complete C4I (Command, control, Communications, Computers and Intelligence) infrastructure is on show. Among the systems on display is the counter-RCIED Guardian system, already selected by several Countries worldwide, the Drivers Night Vision System (DNVS) 4, the NERIO-ULR electro-optical system and, for the first time, the latest Infra-Red (IR) camera SLX-SuperHawk. Leonardo fully addresses the latest requirements of the market in terms of medium armored fighting vehicles, presenting its new technologies on board of the wheeled 8x8 Centauro II, of the Light Multirole Vehicle (LMV) 2and its retrofit/upgrade of existing armored vehicles, as the M60 tank. In this domain, a mission effective system is the HITFACT II large caliber family of turrets, presented on the wheeled Centauro II and also on the tracked ASCOD on the GDELS - General Dynamics European Land Systems – booth, to demonstrate how the gun can be integrated on different platforms according to specific requirements. One of the most innovative products worldwide is the Vulcano, a family of guided ammunitions that exceed the performance of all currently precision-guided projectiles. The Vulcano has attracted the interest of the US Navy and is at the heart of a strategic collaboration with BAE Systems US; collaboration that is poised to open up favorable market prospects. On the occasion of Eurosatory, Leonardo also hosted on its stand the handover ceremony of ELDIG (European Land Defense Industry Group) chairmanship which is moving from Leonardo to Rheinmetall. ELDIG is the European land industries forum which is part of ASD (AeroSpace and Defense Industries Association of Europe), that represents more than 3,000 companies from 19 Countries.